In addition to helping you monitor diabetes and related information, this view is a great resource for your healthcare team. What does the Summary Report Show? The Summary provides a combined view of your overall glycaemic control. This report is designed for print-out, documentation in your medical file or sharing with your healthcare team. You can select preferences to view or change the summary display. If entered, the summary page can also display your vitals such as the latest results of the tests and measurements you want to track, thereby allowing you and your healthcare team to fine-tune your self-management. How can using the Summary Report help improve the way you feel? The blood glucose graphs show you at a glance whether you need to discuss a change in therapy with your healthcare professional. After all, keeping your blood glucose as close to your target range as possible will help you feel better day-to-day. How often should I review my Summary Report? 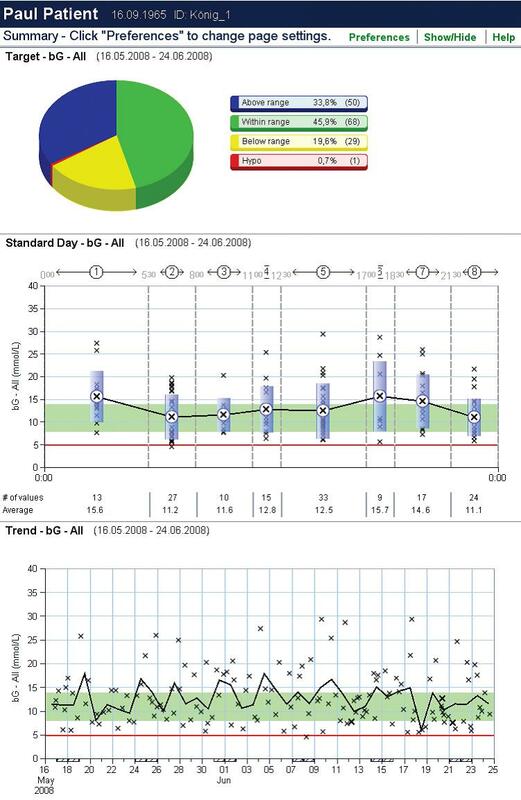 Check the Summary Report weekly or monthly, to get an overview of your blood glucose control. Print a current copy to take along every time you see your healthcare team.